home /The world @work /Would you get up early on a Sunday to see a house you couldn’t buy? Like many real estate obsessed Australians, I’m fascinated by other people’s property, but I’m also passionate about good design. So while the opportunity for a lie in on the weekend is always appealing, I’ve been waiting some time for a spot to join modern and contemporary design expert Stephen Crafti, on one of his popular Melbourne architecture tours. It’s an uncharacteristically sunny winter morning, the clear blue sky is enticing and while somewhere between five and ten degrees depending on your distance from the city, we couldn’t have asked for better weather. From the conversations around me at the meeting point cafe, off Toorak Road in South Yarra, our ‘small’ tour group (about 50 strong) is a quirky mix of architects, students, arty types and industry professionals. They’re at various stages of their careers or retired and the fashions as we board the tour bus, range from low brow to South-of-the-Yarra glamour, reflecting the diversity of those drawn to Crafti’s events. Crafti himself, a successful author and regular contributor to The Age, as well as other newspapers, local and international design magazines, is as much a draw card as the open houses we are going to be seeing. His personal style (he’s sporting signature thick rim black glasses and a fedora today), enthusiasm for the subject matter and witty running commentary are also part of the experience. Our first house at 15 St Helen’s Road, Hawthorn East, was built by Davey Architecture Studio in 1982, and John Davey lived and worked here for 25 years. Featured in the August 2017 edition of the The Boroondara Bulletin, Crafti describes it as 80s brutalist. Testament to Crafti’s literal ability to open doors, we’re met at the property by Davey, as well as current owners Phillip Schluter and Liz Wu. While the exposed concrete blocks, dark yellow corrugated columns and black steel framed windows (likened to the Pompidou modern art museum in Paris) no doubt appeared radical set amongst the neighbouring heritage homes at the time , ironically the whole back garden including the pool is now overshadowed by a two storey faux Georgian monstrosity. We’re told the original colour scheme had a fuchsia palette. Inside over split levels you can still find bright blue benches, but the pink carpet is gone and accent colours are now olive green. Some later additions are also eye catching: there’s two giant calligraphy prints hanging in the living room and a red peg board coat rack that work for me. Crafti has offered to redecorate with 80s furnishings. He’s both good natured and deadly serious. We cross town to Kensington to see Tim Hill of TANDEM Studio’s own True North house at the corner of Eastwood and Parsons Street. Built in 2016, it has a just finished quality enhanced by the shiny corrugated façade and the deliberate absence of window coverings (still a point of contention between Hill and his partner). Privacy has nonetheless been considered in the siting of the building. Set on a triangular block that tapers from double front to a single room, it references the boomerang shape popular in 1950s design. Built-in seating and dare I say an almost caravan style dining table were made necessary by the rounded walls. With its bright inner courtyard, pin spot LEDs, light timber panelling walls and ceiling and exposed wardrobes, it has a contemporary Scandi feel. Hill has rescued a historic cottage and stables (heritage listing pending) at the rear, adding to the holiday feel. And yes, it’s occasionally rented out on AirBnB. 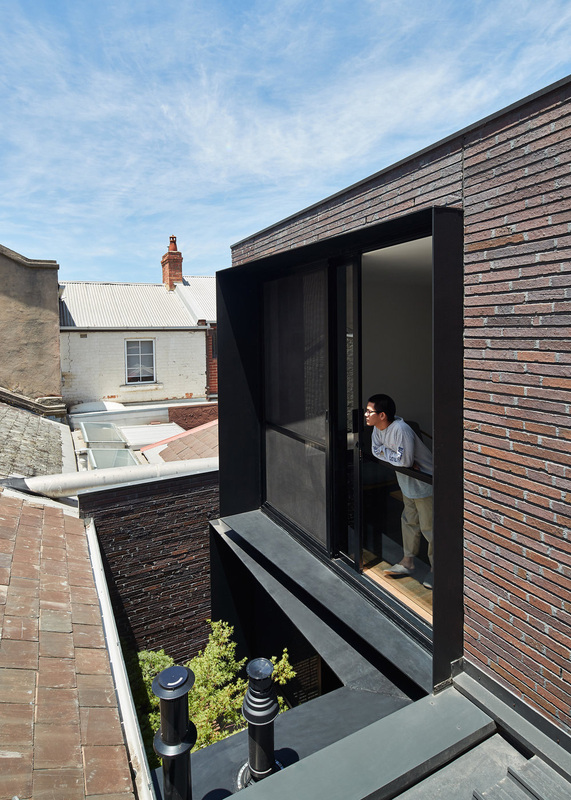 TANDEM won a Commendation for the project in the 2017 Victorian Architecture Awards. Back on the bus, Crafti says while some notable property owners are prepared to give him personal access to their houses, he’s only interested in those who feel benevolent to share their homes with the public. All of the places we visit are well lived in, certainly not display homes. Our hosts greet us with their partners, children, housemates and dogs. They’re wearing their weekend clothes, carrying their groceries or doing whatever they happen to be doing when we call on them, like visiting relatives. Although the mood is casual, months of planning goes into these tours. After lunch back in Toorak Road, we head Northside again. Next is a tiny Victorian terrace on Elgin Street, Carlton, normally entered via a discreet doorway from a laneway behind Canning Street. Its façade blends with the period from the front; it’s disguised amongst a series of commercial use conversions at the rear. Architect Wilson Tang from Sonelo Design Studio has contrasted dark (dark timber window slats and black mirrored walls) and light (a bright loft bedroom and internal lightwell courtyard) in this small space. There are some clever modern touches, including folded steel stairs and folded metal shelves, perforated acoustic panels and a dining table on wheels that slides away for greater floor space. Contemporary light fittings also contrast with the older style front rooms, while wide timber floors and flush horizontal lines on the brick feature walls serve to anchor the high ceilings. Owner Arya Triadi is from Indonesia, bringing aspects of Bali style to create a shady space that anticipates the summer heat. The project is a strong example of Crafti’s argument that good design can make small spaces richer and more meaningful. Our last stop is a real showstopper. From the street, 26 Hampden Road is a private enclosed bunker, a cross between fortress and art gallery, not quite what you might expect to find in the quiet streets of Armadale. Designed by BE Architecture and featured in Australia by Design’s Top 10 Australian Homes, the build took 60 tonnes of granite. The tough exterior gives way to a luxurious interior where no detail has been spared. Hard surfaces extend to stainless steel kitchen benches and cupboards (repeated in a butler kitchen bigger that’s almost bigger than my apartment), which are softened by exquisitely crafted curved tiles in the laundry and bathrooms. Even the granite basins are textured from smooth to coarse. There’s a feast of contemporary artwork, including a MONA-esque LED screen installation (a video of fluorescent tubes). A brass balustrade leads up to an oculus skylight and a Japanese inspired garden off the master bathroom, complete with freestanding granite bath and a cute outdoor shower. Of course there’s a beautifully integrated swimming pool, overlooked by a Julliette balcony from the living room. The automatically controlled upper storey window shutters and underground car parking (accessed by a lift) could be triumphs of engineering. Owners Russell and Ros are unobtrusively present while architect Andrew Piva takes final questions from our group. We finish the tour with a drive by of some extraordinary Holgar & Holgar Toorak mansions from last century (vulgar and vulgar to some, Crafti points out), each suitably OTT. While he’s carefully avoided making his architecture tours into Lifestyles of the Rich and Famous and the experience has been both authentic and entertaining, the one thing missing has been a beautiful garden – none of the properties we’ve seen has really had one. As the day concludes I’m hankering for what Crafti will have to show us on the next tour… perhaps a stunning home with landscaping to match or an inner city pad with a carefully curated balcony that’s overflowing with greenery, like my place. Are you a subject matter expert on a creative industry with a unique Point of View? How have you turned your creative passion into a successful career in the world @work?